We have now developed a range of chilled pizzas that you can cook in your oven at home. Using exactly the same quality ingredients and recipes as our takeaway pizzas, they cook in your oven in around 5 minutes and will keep fresh for up to 5 days and can also be frozen. And most importantly, they taste fantastic! They can be purchased from us directly by pre-order and then collected from our store or delivered to your door (minimum delivery order of £12 will apply). To place your order, please fill in the following form and we will call you when your order is ready. 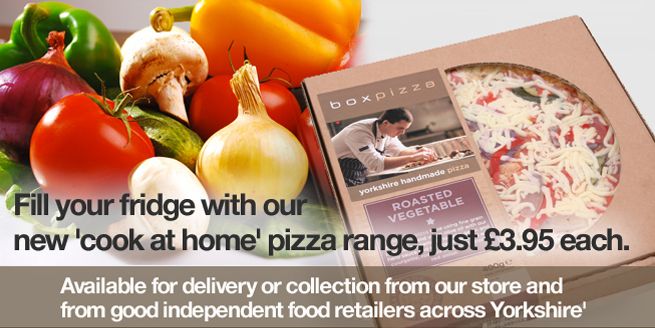 Alternatively, our pizzas are stocked in various independent food outlets in Yorkshire and some beyond. So if you live outside our delivery area, here’s a list of places where you can pick them up. Please note, we are expanding our stockists all the time, so if you don’t see anywhere local to you, please check in your local farm shop/deli, we may be there! Want to become a boxpizza stockist? 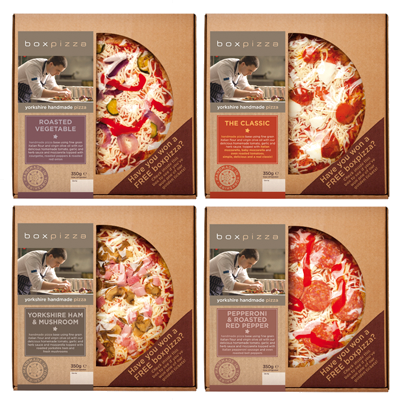 Our chilled pizza range has become very popular throughout Yorkshire and beyond. If you run a farm shop/delicatessen/independent food outlet and are interested in selling our products, please email us here with contact details or ring 0113 2445544 for a talk about how we could help your business.